Confused about how to pay bills for Kotak credit card! No idea about the payment! Here is a solution for you. To meet the needs of its different customers, Kotak Mahindra Bank issues different types of credit card. With these Credit Cards, the bank also provides multiple types of payment methods that you can choose as per your conveniences. To satisfy its customers, the bank provides 5 online and 4 offline methods of payment. The most important thing with the bank is that the mode of payment is very fast and the payment statement will be displayed in the credit card account within 24 hours to 5 working days. This is no doubt a golden opportunity to the customers to pay for the credit card with these convenient methods.The most popular and convenient methods are online payment and offline payment. For online payment a customer needs to know the IFSC code first. The IFSC code or the Indian Financial Service Code is the 11 digits code assigned by the Reserve Bank of India. The code helps to identify every branch uniquely. This IFSC Code is used for electronic payment in any bank. 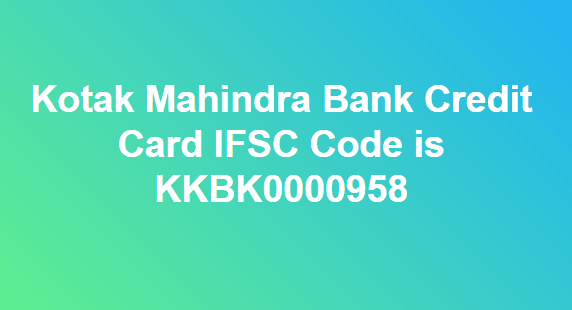 For online payment on the credit card, Kotak Mahindra Bank uses this IFSC code which is KKBK0000958. The bank uses this number for online payment under NEFT. How to use Kotak credit card IFSC code for credit card payment? Login online portal of your bank and choose funds transfer. Now select NEFT and include Kotak Credit Card to your Payee List. Now enter following details for the transfer of funds. Enter the 16-digit number of your credit card along with customer name i.e. the payee name. Select account type and then select Kotak Bank. Update the Payee account number i.e. enter the 16-digit card number. Your transaction is now completed and the payment made by you will display in your bank account within 2-3 banking working days.